Discover the Simple Teaching Strategies You Can Use (Right Now) To Eliminate Classroom Management Problems Forever! I am sure that you got into the teaching profession for all the right reasons. Maybe it was a love for children, or the chance for a fulfilling career that goes beyond a simple paycheck, or maybe just the chance to have an impact on the future of our society. Your reasons for becoming a teacher are noble to say the least. Unfortunately, if you’re like most teachers, you find yourself focusing most of your attention on classroom management issues rather than on teaching, and you now realize that all those college courses didn’t quite prepare you for teaching in the real world. The problem is that while teachers enter the profession filled with great ideas, they find it extremely difficult to implement those ideas due to classroom management issues. And, the sad fact is, too many teachers fail because of problems with classroom management. Which half do you want to be in? I urge you…Don’t let the most rewarding profession in the world pass you by because you were simply not trained to teach in the real world. The truth is, your classroom management style and academic achievement are more than just a little connected. Let me make this point perfectly clear: There is a definite and direct correlation between classroom management style and academic achievement. If you are having problems with classroom management, then your students will certainly have low academic achievement scores. And, the end result is that you will not succeed as a teacher. In response to classroom management problems, teachers immediately start to resort to “management” plans. They assign seats, give detention, and come up with elaborate systems of rewards and punishments. These types of classroom management plans are not truly effective. They are temporary solutions to ongoing problems. The fact is in order to succeed as a teacher you must combine classroom management with methodology in the best practices of effective teaching. Whether your focus is on first grade classroom management, third grade classroom management, or twelfth grade classroom management, if your plan is based on rewards and punishments you are only providing a temporary solution to an ongoing problem. And, these classroom management problems only get worse with time. In the end, disruptive students will keep you from teaching the way you should. Despite what many may think, people are not born teachers. Becoming a Master Teacher takes training and practice. Teaching is a skill that is learned. Simple, I am a teacher in the “trenches” just like you. My name is Adam Waxler. I am a retired middle school social studies teacher and teacher mentor. After teaching for many years at Springs Middle School in East Hampton, New York, my family decided to relocate to Bradenton, Florida where I recently taught 8th grade U.S. History at Carlos E. Haile Middle School before I retired. As a teacher mentor I loved seeing the energy and enthusiasm that new teachers bring to a school. Unfortunately, too many new teachers quickly find themselves focusing most of their attention on classroom management problems. I know what new teachers and teachers early in their career go through. In fact, I made a promise to myself to never forget how difficult the first years of teaching can be...Not only are you learning the in’s and out’s of a new school system, but you are developing curriculum materials, designing lesson plans, grading, AND teaching. I promise you, you CAN implement all your great teaching ideas, and you CAN keep that enthusiasm, but only if you know the teaching strategies that will allow you to do so. I have seen too many teachers not survive their first couple of years of teaching because they simply refused to take control of the situation. 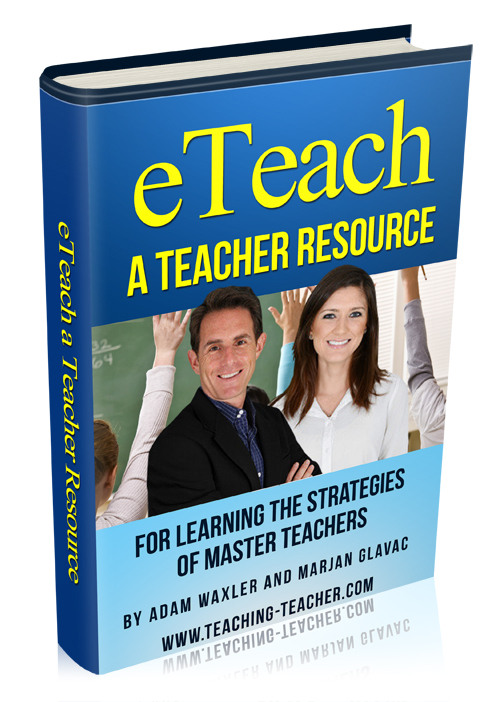 Therefore, after mentoring teachers for years, I decided to turn my work into an ebook entitled eTeach: A Teacher Resource for Learning the Strategies of Master Teachers. Use easy tricks to keep YOURSELF on task during your lessons! You'll come to work everyday excited to teach!! If you have experienced classes where it seems your students just didn’t get anything done, where instead of teaching students in a caring environment, you felt like you were in a constant battle with them, or even if you are just looking for ways to help improve your teaching, then my ebook is for you. My ebook will teach you the skills you need to become a Master Teacher and provide you with that fulfilling career you’ve always dreamed of. eTeach is designed to provide both novice and veteran teachers with actual teaching strategies that you can immediately apply to any classroom. This ebook is purposely written in a conversational tone so it is easy-to-read, easy-to-follow, and easy-to-apply. Best of all, you can start applying these strategies in your very next class. There is no waiting. You will receive eTeach by download and will be reading the book within minutes. School districts across the country are paying upwards of $3,000 per day for professional development seminars that teach only a fraction of what is taught in this ebook. And graduate courses can easily run over $2,000 per class before you even buy the required reading. In order to help as many teachers as I can I am offering eTeach at a special discount rate until Monday, April 22, 2019. Finally, I'm throwing in an five exciting bonuses if you order online by Monday, April 22, 2019. Ok, you’ve heard me mention how my ebook will provide you with all the skills you need to receive tenure. However, you also need to know the rules of the game. That’s right, getting tenure can be compared to playing a game. If you don’t know how the game is played, you certainly won’t be any good at it. You could have the best baseball skills in the world and it wouldn’t do you much good if you kept running to the wrong base. By combining the skills you’ll learn in my ebook with my special report, 10 Things Every Teacher Needs to Know In Order To Receive Tenure, your appointment of tenure is in the bag! Let’s face it…when it comes to teaching, time is your #1 enemy. While my ebook has an entire chapter devoted to time management strategies for your classroom, it would simply be impossible to fit everything you need to know about time management into just one chapter. You see, being an effective teacher involves more than just strategies for the school day and school year. To be a truly effective teacher you need to apply time management strategies to your entire life. That’s why I have developed The Ultimate Time Management Guide for Teachers. However, you must act fast. I will be turning this report into it’s own ebook for sale on it’s own web site. Of course, when I do, I will obviously be pulling it off the shelf as a free bonus. Here is your chance to grab a copy for free. 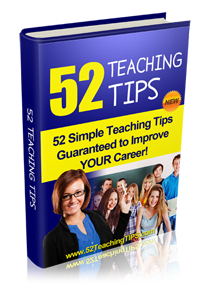 52 Teaching Tips Guaranteed to Improve YOUR Career! 52 Teaching Tips will provide you with simple teaching tips that you can easily apply to your very next class. and a definite decrease in classroom management problems. 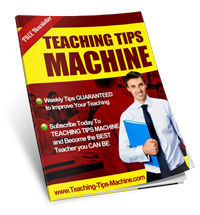 Over 100 Weekly Teaching Tips Guaranteed to Improve your Teaching! This e-newsletter will provide you with simple teaching tips each and every week that you can easily apply to your very next class. Short timely tips that you can print out, post them in your classroom, and pass them around to other teachers. These tips are designed to be applied immediately. Regardless of how effective a teacher uses proactive classroom management strategies, minor disruptions will still occur in the classroom. Those nagging issues that don’t seem drastic enough to write a referral for, but can still be extremely disruptive to learning and can simply gnaw away at a teacher’s last nerve. Issues such as talking while the teacher is talking, writing or passing notes, and minor roughhousing. This report is about stopping those MINOR classroom management problems, before they become major ones. Your satisfaction is assured through my no risk, no-questions-asked, 100% money-back guarantee. Take a full 60 days to examine and start applying these teaching strategies. That's right, 60 days to put this valuable course to work in your own classroom. Once you've used these strategies in your own class, I'm confident you'll be more than satisfied. But, if you aren't satisfied for any reason, or it doesn't live up to your expectations, I will refund 100% of your money...No questions asked! Think about it, for just $37 $27 you can start applying teaching strategies that will greatly improve your teaching career. You have nothing to lose and an extremely successful, fulfilling teaching career to gain. Click here to kick start your teaching career. Finally, because you are entrusting me with your confidence, I want you to keep the Special Reports—free of charge—even if you ask for a refund. That’s a guaranteed gain no matter what you decide. Once your credit card is approved, you will be taken to a special download page where you will download the ebook and free special report. You will be downloading and reading the ebook and incredible bonuses within just a few minutes...and using it in your very next class! I look forward to hearing from you, telling me about your success at applying these strategies and how much you are enjoying teaching, but most of all how much your students are getting out of your lessons. Even though I get an enormous amount of email please write me. I’d love to hear your teaching success story! P.S. The special discount price of $27 won’t last forever...so act fast! P.P.S. Remember, I guarantee that just one of my teaching strategies will improve your teaching immediately; otherwise you can return it anytime within the next 60 days for a prompt 100% refund. P.P.P.S. 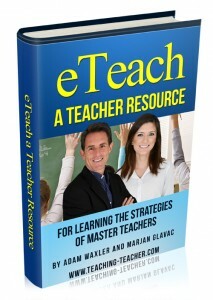 If you pass on this offer, will you have all the tools you need to become a Master Teacher? Let's face it, if you are currently teaching or just entering the profession, you already have the desire and heart to become a Master Teacher. Most of what you need now is instruction in the proven practices of the Master Teachers themselves.